Public restrooms are often stocked with the type of toilet customary to the region. Portable toilets have increased in popularity in public gatherings. They are relatively easy to move and inexpensive. 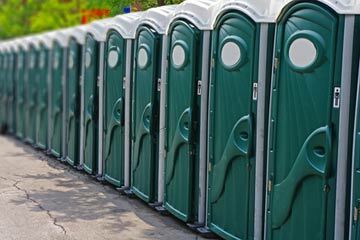 Large gatherings in open spaces where restrooms are not permanently placed are a perfect venue for the portable toilet. They usually consist of a self-standing, closet type structure large enough to fit one seated person comfortably. Instead of a flushing mechanism, portable toilets have their own waste tanks. These tanks are often filled with deodorizers and disinfectants to ensure the portable toilet will be ready for continual use as long as possible.